After the struggle following the first Occupy LA General Assembly in which a small group of protesters balked at the police demand, insisted upon by the Occupy LA Security Committee, that all tents be moved to the sidewalk after 10:30pm, this group congealed into what they begin calling themselves the “Police Brutality Committee.” They did this without seeking or receiving approval of the GA.
On Sunday, the 2nd day of the occupation, this group met together the better part of the day in preparation for the evening GA. When they met as the Police Brutality Committee, they resolved to call for the disbanding of the Security Committee, which they said acted like police and took orders from the police. Even through the LAPD has so far been exceptionally helpful and courteous, this group wants Occupy LA to refuse any cooperation with them. For example, Sunday a single police car monitored the the protest camp at city hall from across the street that at times had close to a thousand people in it. There have been no arrests and no reported incidents. When people marched on a bank Monday and went into the lobby and passed out flyers, the police didn't try to stop them. When asked why they were there by one protester, she was told they were just there to make sure the protesters didn't do something like writing on the wall. I wish I had been there. I would have told him the writing was already on the wall and that's why we are camped out on the city hall lawn. In more personal conversations many have expressed support for our cause. This is quite understandable because the economic crisis effects them doubly. First, the impoverishment of the people means doing their job on the streets is all the harder and more dangerous. This is true whether you call it “suppressing the masses for the Man” or by any other name. Secondly, the cut backs in city budgets puts them in danger of losing even that job. In spite of this real world situation, members of this self-appointed committee stated frankly that they didn't consider police to be part of the 99% and they wanted to be more confrontational with the police. Although their stated purpose was to raise awareness about police brutality, they have been spoiling for a fight with the police. Some of these same people dominated the facilitators meeting that set the agenda and choose the chairs for the third occupation GA. It would also appear they had influence on picking the stackers because some people had undo trouble getting on the speakers list, But when they got to the part of the agenda they had been waiting for, the report of the “Police Brutality Committee” there was such strong opposition to their proposals that they quickly tabled them without allowing discussion. The next day, at the General Assembly, they pushed a much more limited agenda, but then they didn't have the control of the process that they had the day before. Also, someone pointed out that this committee had never been sanctioned by the General Assembly and they were forced to petition for approval. There was much opposition to approval and the matter was tabled again. They also put up a facebook page with the misleading title “End Police Brutality at Occupy LA.” That was also met with growing opposition, so more struggle around this issue was expected at this evening's General Assembly. But that GA was facilitated by an entirely new group and with many first time attendees both from the public and the media, it wasn't dealt with then either. 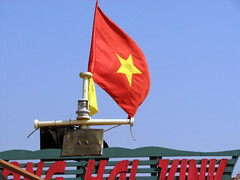 It is planned to work on that issue at a quieter time Wednesday. 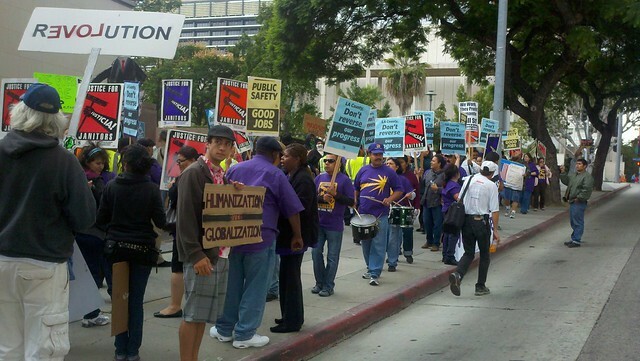 Also Tuesday, Occupy LA did a joint demonstration with members of SEIU janitors local. About a hundred union members and an equal number from Occupy LA members marched in front of the post office on Temple Ave several blocks from city hall for about an hour. On the way back to city hall, they stopped at Michael Jackson's doctor's trial and serenaded the media camped out there with chants. Local media coverage has been growing in the past few days with TV trucks parked near the encampment most of the time. This is addition to the army of satellite trucks at the Murray trial. This local news coverage is bringing a growing number of Angelenos out to the protest. Two Los Angeles councilmen, Eric Garcetti and Bill Rosendahl came out of the building to talk to the protesters and hold press conferences, naturally. Tomorrow they are joining Richard Alarcon in introducing a support resolution for Occupy Los Angeles in the city council on Wednesday. The protesters plan to pack the chamber. Also Tuesday, a representative from LA Union, the LA County AFL-CIO came by to ask our support for a joint protest of energy giant SEMPRA on October 13th. A General Assembly was called on the spot and the action was endorsed. Thursday they have another labor action planned with SEIU. 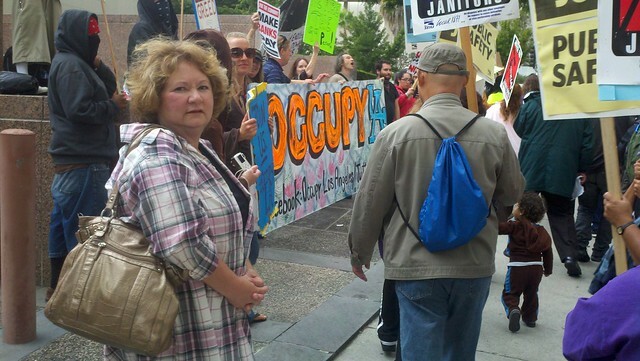 Only four days into Occupy Los Angeles and they already have gotten great labor support and significant major media coverage. The outpouring of support from the Los Angeles community has been incredible. They have not lacked for food or water or anything as so much is being sent to them by the public, everything from tents and sleeping bags to baby wipes. They received no less than three pizzas deliveries today, one was about three dozen pizzas. One protester/journalist tweeted that they had better plan a lot more actions or he was going to start gaining weight. 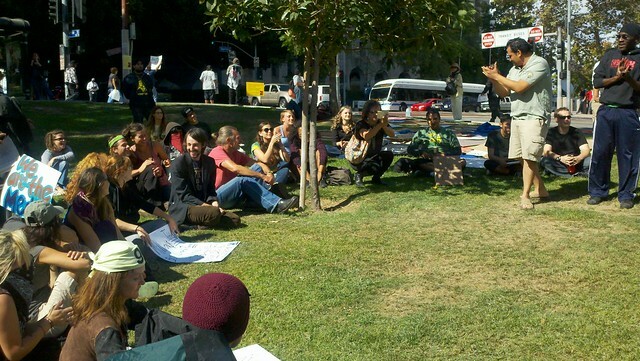 More and more people are joining Occupy Los Angeles everyday and this makes the growing pains like those associated with the Police Brutality committee a relatively minor concern. It always feels like spring in Los Angeles, but this is starting to feel like an "Arab Spring."